Dragon was carrying more than 4,000 lbs. (1,814 kilograms) of food, supplies and scientific experiments. The scientific gear included high-resolution cameras designed to observe and study meteors as they plow into Earth's atmosphere, as well as equipment that would have helped researchers better understand which microbes are present inside the space station, and how these organisms change and adapt over time. And Russia's unmanned Progress 59 vessel fell back to Earth in May without reaching the space station, apparently done in by a problem with the third stage of the Soyuz rocket that launched it to space. Despite this recent run of setbacks, the International Space Station (ISS) remains well-provisioned into the fall, NASA officials said. "We're good to the October timeframe if no other vehicles show up," NASA ISS program manager Mike Suffredini said during a prelaunch press conference Friday (June 26). If Dragon had made it, the $100 billion orbiting complex would have been well-stocked through the end of the year, he added. The next Progress freighter is due to launch July 3 from Baikonur Cosmodrome in Kazakhstan. SpaceX had also aimed to land the Falcon 9's first stage on an "autonomous spaceport drone ship" during today's launch, in a test of reusable-rocket technology. The company is trying to develop fully and rapidly reusable rockets, in order to slash the cost of spaceflight. "A jumbo jet costs about the same as one of our Falcon 9 rockets, but airlines don't junk a plane after a one-way trip from LA to New York," SpaceX representatives wrote Thursday (June 25) about the company's reusable-rocket goals. "Yet when it comes to space travel, rockets fly only once — even though the rocket itself represents the majority of launch cost." 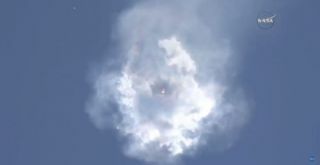 SpaceX had tried the rocket landing on the previous two Dragon launches, and nearly succeeded both times: The rocket stage hit the boat but came down too hard, toppling over and exploding on the deck. Today's rocket failure nixed attempt number three, obviously.